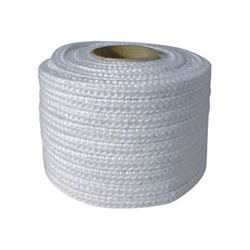 Leading Manufacturer of high temperature round glass fiber braided rope, fiberglass insulation material, vermiculite coated fiberglass square tape, fiber glass rope, glass fiber rope and high temperature resistance glass fiber tape rope & cord from Ahmedabad. Glass Fiber Braided Rope are made of continuous filament texturized yarns and are extremely strong, resilient, and flexible. They are widely used as gasket for industrial ovens and furnaces, boilers and wood burning stoves. They are asbestos free, cause no harm to health, making them ideal replacements to asbestos ones. 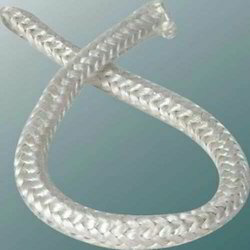 For higher loads, the round braided and square braided ropes can be reinforced by steel wires. They also can be coated with graphite or vermiculite to increase thermal insulation and abrasive resistance. 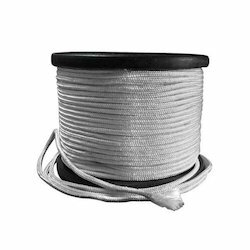 Fiberglass insulated thread, rope(twine thread,rubber filling rope) are made of resisting high temperature and high intensity fiberglass by special technic. It is mainly used as insulation material of electrical machine, instrument and other electrical equipment. And it also be used as soft tie-in of fill-in material, boiler and boiler wall, or other industry field such as insulation of heat up cannulation, chemical industry, machine, etc. Other usage are sewing of high temperature resistant weave, electricity insulating material, heat insulating material, cable padding material, fireproofing material, wick, sealing product, voluble electrothermal thread, and heating elements. Packaging Details: 5, 10 & 25 Kg per Bundle. 100% Dust Free Packing. As Per Your Requirements. Every Bag wills Be At Best Quality Packing. Per Roll/Bundle will be pack in a Plastic Packaging. Vermiculite Coated Fiberglass Square Tape further question, please contact me by email or phone. Your drawings are required for us to quote and we will try best to satisfy you with competitive price as well as high quality. Wish we could take the chance to promote our business relationship. Fiber Glass Rope are comprised of 'E' class fiberglass yarn cores with a spun polyester fiber overbraid. The polyester braid provides a dry, user friendly jacket which eliminates the need to directly handle glass fibers during installation. It is designed for surge ring and other structural applications requiring a rigid insulating and high mechanical strength material. Braided from texturized glass fiber yarn. It is used for the material of keeping warm, insulating against heat etc. It is the excellent substitute for asbestos. Rectangle section is also available. Metallic wire reinforced on request. For sealing coke furnace, stove and boiler burner, chimney door, pump and valve, exchanger. Besides,we also produce glass fiber round rope, twisted glass fiber rope, glass fiber round rope, graphite glass fiber round rope, glass fiber round rope with rubber, glass fiber lagging rope, glass fiber knitted rope, glass fiber knitted rope with graphite, glass fiber sleeving, glass fiber sleeving with silicone. We have a good markets for glass fiber products all over the world,different levels are produced by us. 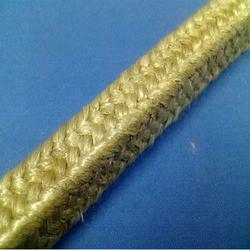 Glass fiber is a product that is easily knitted to form tapes, ropes and cords. Tapes are used as heat proof seals on boiler or oven doors and usually come plain, or latticed. 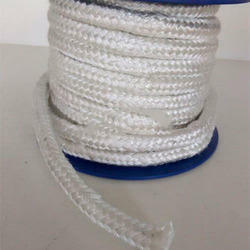 Ropes and cords may be similarly used, or used as pipe insulation. Many widths, and diameters are available. All come in rolls, usually 30 meters in length. This product has excellent thermal resistance, but should not be used as a seal against pure steam. Because of it’s soft pliability it is excellent for filling gaps where temperatures are relatively high, but pressures are low. Before Sales: Free sampls and catalog will be provide to our clients for reference. All the questions and requirements will be answered at first time. Middle Sales: PI will be send according to buyer's purchase order. Our sales person will be charge of producing through the complete process. and will send pictures about package before shippment. Tracking No. or copy of document will be send to buyer for prepairin custom clearance at their side. After Sales: Our after sales team will track the use of our items, including qty. and our service. And also will inform clients promptly if there is a salse promotion.